Military-societies inherently posit violence and oppression as guiding cultural principles. Compulsory military service creates a dehumanized cultural condition. The culture within the Korean military is bad. A government with the power to force labor from its citizens is situated on slippery slope where it may become more authoritarian. The driving principles of human civilization ought to be the mutual benefit of all humans, not violent competition. In a world with more than enough resources to feed every human being living, our culture ought to be moving towards making that happen, not becoming more efficient killers or competitors. Cooperation is the basis of a humanistic civilization. Those serving in the military as well as their loved ones will have to come to terms with the fact that serving in the military may include having to fight and kill enemy soldiers. It is easier to come to terms with this if the enemy is dehumanized. The essential operation of any military is to institute and execute mass murder, under the larger operation of calcifying the hegemony of some political power. In fact, the military is the very manifestation of violent coercion. To force an entire population to universally experience complicity in this violence is necessarily to emphasize it above any other human experience that is not made to be distinctly universal within that culture. Conscripted military service may increase the chance of war. Conscription could blur the lines between civilians and military targets. Exposing young men and women to weapons and desensitising them to violence may lead to increased criminal tendencies. The military, and conscription itself, are posited on instilling obedience in citizens, and not questioning superiors. This mindset is dangerously dictatorial. The thesis allows for a non-military conscription option. 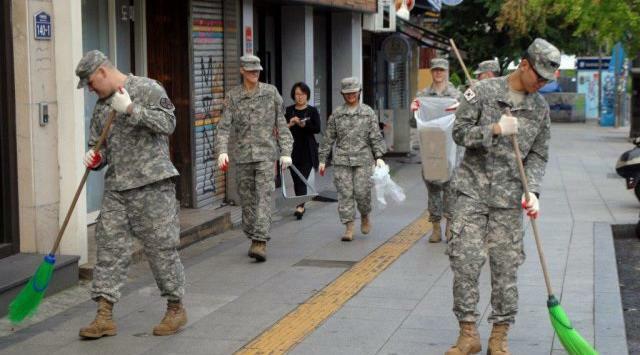 Texas State Guard is a military organization, however its focus is on community service, and is staffed with volunteers and doctors that assist during natural disasters. Switzerland has compulsory military service, and is one of the most stable, non-violent nations in the world. Militaries are not solely based on the desire to inflict violence; military society emphasizes many positive values like collective solidarity, cooperation, and shared identity. Countries with existing compulsory national service are well regarded by their citizens. This is not strictly the case. A society that is highly militarized is not, necessarily, emphasizing external or hostile application of that military presence against their own citizenry or other nations.